Our primary purpose is to educate our members on the variety of career opportunities throughout the accounting profession and prepare them for the on-campus recruiting experience. At each meeting, guest speakers from different firms discuss the latest trends and perspectives involving local, mid-size, "Big Four," government and management accounting firms. We've also hosted speakers from CPA exam prep and review agencies, who discuss updated exam information and preparation tips. Weekly Meetings are held in North Hall 1006 every Tuesdays at 6:30 PM. Every year, the Undergraduate Accounting Society hosts a spring awards banquet to honor outstanding students in the UCSB Economics & Accounting program. Qualified students are invited to self-nominate themselves for the awards. This year's banquet was held on May 3, 2018. ​Photos from the event are available under our photos tab and on our Facebook page. We extend warm congratulations to award winners and their families. 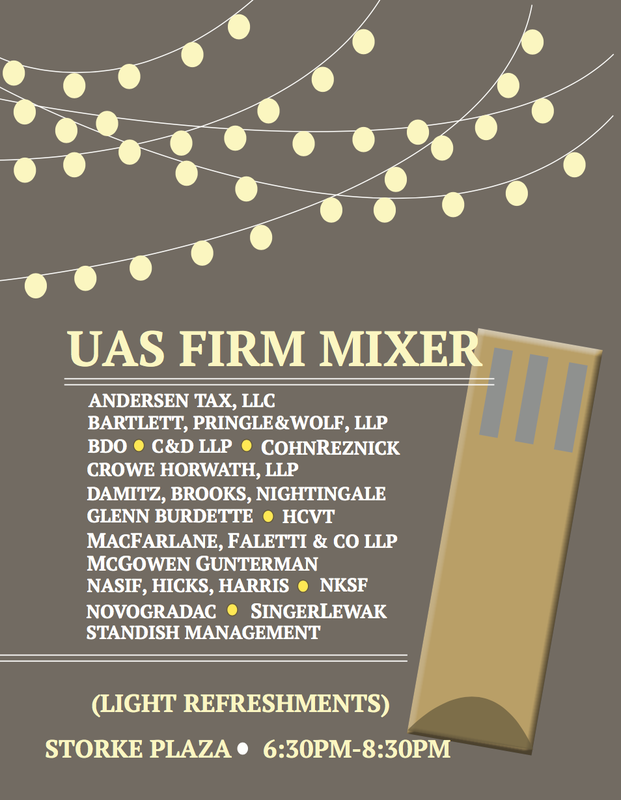 ​We wish to thank to the professionals in attendance and the firms represented. Thank you for attending these events. We look forward to hosting more in the upcoming year. Meet the Program is the first-ever event of its kind! This event is designed for freshmen, sophomores and transfers, though all class levels are welcome. Take this opportunity to get involved with the Economics & Accounting program and affiliated clubs and student groups. 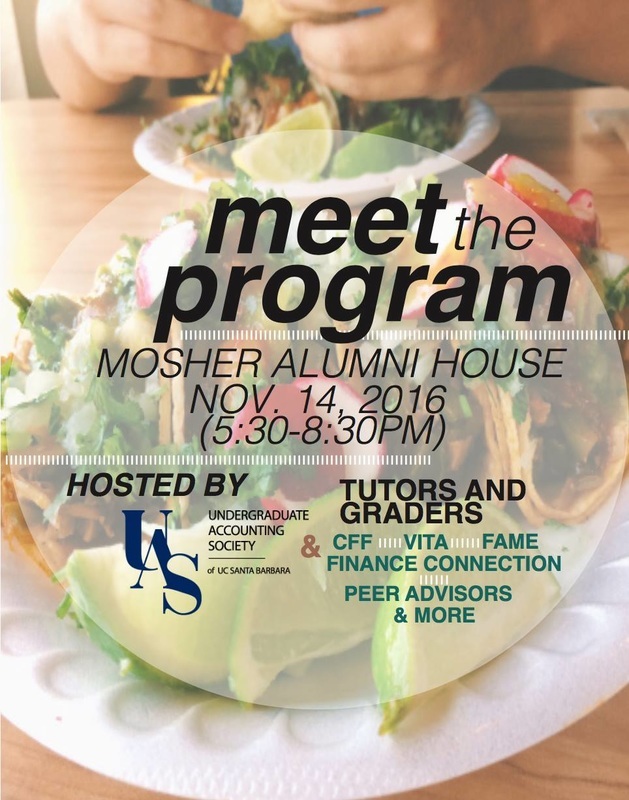 UAS, the tutors and graders program, VITA, CFF and Peer Advising will be available to answer your questions. Some of these student groups will be tabling and recruiting for leadership positions for the upcoming year. This networking event allows students to meet firm professionals in a casual, inclusive setting. We're excited to welcome representatives from 16 firms. Instead of tabling, expect firm professionals to be mingling among students to spark conversations. Light refreshments will be provided. ​This event is for networking purposes only. The Gauntlet is a recruiting preparation event that sequentially runs groups of students through a resume critique, followed by a mock Meet the Firms experience, and finishing with a mock interview. Volunteer accounting professionals from all the Big 4 firms to local firms staff the three stages. The Gauntlet is great preparation for students who will be attending Meet the Firms, interviewing for positions, and participating in the busy recruiting season in the Fall.